Pan-frying grouper is a simple process. Grouper is part of the sea bass family -- or the Serranidaes -- and possesses a mild flavor similar to halibut. Grouper is ideal for cooking, as it is firm and moist. Available types of the fish include red grouper, black grouper, gag, snowy, Nassau and Goliath, which can be harvested year-round. Rinse grouper fillets, and pat dry with a cloth or paper towel. Check for bones, and remove from fillets. Heat olive oil for a couple minutes in the skillet over medium-high heat. Place fillets in skillet and cook for around three minutes per side until each side is flaking and a light brown. 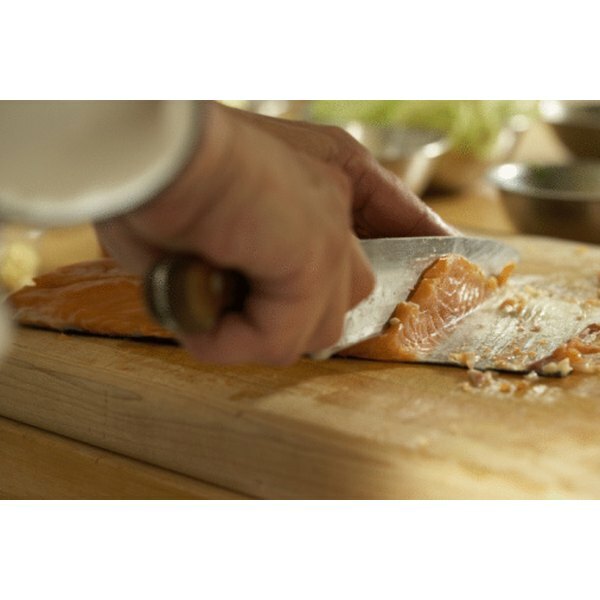 Remove the group fillets with a slotted spatula, and season to taste. A good tip to know when grouper is finished frying is to note when the fish begins to flake. Once it is flaking, it is completely cooked. Charity Corkey has a B.A. in print journalism and more than four years of writing and journalism experience - including her work as a former writer and online producer for The Washington Post and The Washington Times. She is now a media coordinator for a Virginia nonprofit that provides assistance to injured troops.